As near as I can figure there are only three fan blogs in all of minor league baseball. (I could be wrong. That’s happened once or twice. Let me know if I am.) One of them is Bacon and Biscuits the child of Matt Creedon and it follows the Lehigh Valley Iron Pigs and another team that plays an obscure game that involves wacking stuff around on ice. The Bulls went 2 and 2 in a four games series against the Iron Pigs at the DBAP back in early May. 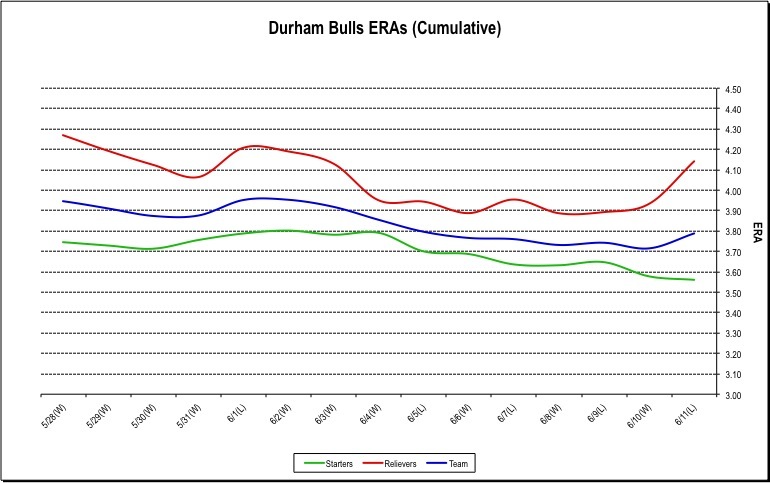 As the Bulls roll into the Lehigh Valley, here’s Matt’s take on where the Phillies Triple-A franchise is this year. The IronPigs came into the season with the youngest roster that they have had in their six seasons in the Lehigh Valley. The average age of the Opening Day roster was about 26.5 years old and six of the Phillies’ top ten prospects started the year as Pigs (3 are still on the team, 2 are on the DL, and Jonathan Pettibone is in the Phillies rotation). There were also a number of players who contributed to the Phillies in 2012 (Tyler Cloyd, Joe Savery, Justin De Fratus, Pete Orr, etc.) who weren’t necessarily considered prospects (or at least in the top ten) that made the Opening Day squad. Because of that there was a lot of excitement and high expectations around the team back in April. There was also some concern that the team might struggle early and that proved to be the case. 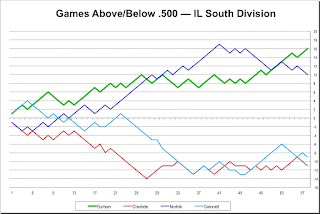 The Pigs lost four of their first six games (all at home) and finished April at 10-15. In their last 12 April games they went 3-9 including being swept in four games at home by Buffalo. Along the way there were very few transactions which is rare considering the shape the Phillies were/are in and the simple fact that this is Triple-A. So it was concerning that the team played poorly despite all the promising pieces being in place for the entire first month. May started off kind of shaky, but after the 3-5 road trip through your place and Norfolk, the Pigs really stepped it up at home, a place they have played very well at over the past few seasons, but did not through the first month and a half. Starting on May 18 - which oddly enough was my first game of the season. 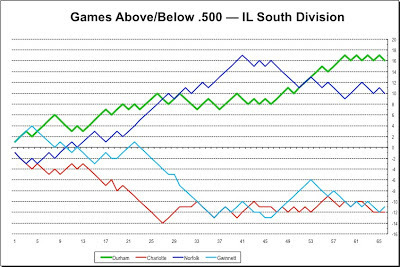 I guess I’ll take some credit – the Pigs won 8 of their next 9 home games and ended the month one game over .500 at 15-14 (25-29 overall). They haven’t slowed down a bit at home since. In June they have won 8 of their 11 home games, which means that since May 18th they are 16-4 at Coca-Cola Park. 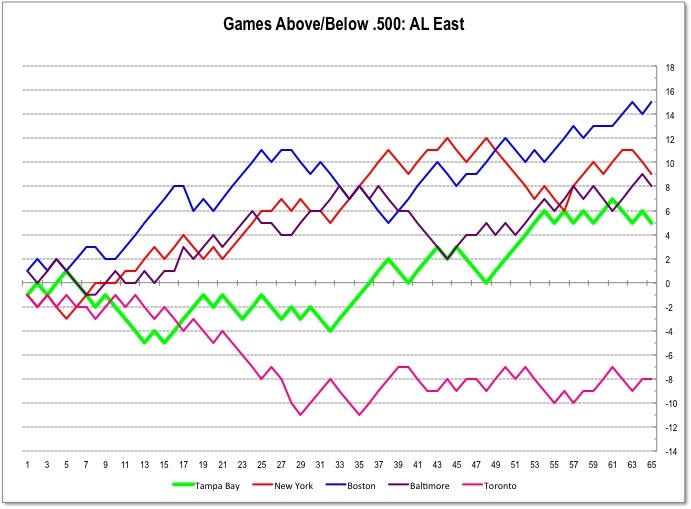 The result is a 40-36 overall record and a half game lead in the Wild Card race. It might not sound that impressive, but they have come a long way. They just need to learn how to win on the road. The team’s performance aside, one guy who has been good all season is 23-year-old 2B Cesar Hernandez. 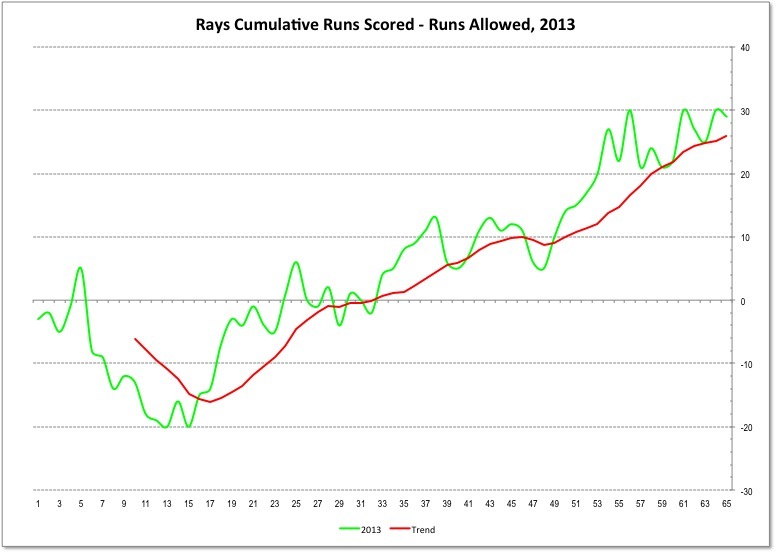 He hit .375 in April and continued to hit well over .300 for much of the first two months. He’s down to .296, but he still has a team-high 21 steals and IL-high 7 triples. Cesar also got some time with the Phillies when Michael Young went on bereavement leave (May 29th) and stuck with the team for two weeks. He’s back and hitting .263 in his last ten games. 22-year-old 3B Cody Asche is leading the team in RBI with 44, hits with 77, and games with 72. He has been very good offensively and defensively and figures to be the Phillies 3B next season (and hopefully long afterwards). LF/1B Darin “Babe” Ruf had a chance to make the Phillies out of Spring Training, but wasn’t well adjusted enough in LF to make the team. They moved Ruf to the outfield after he hit 38 home runs with Reading (AA) last year. That broke Ryan Howard’s single-season record at Reading. Howard is of course blocking him at 1B. He’s 26 and wasn’t really on anyone’s radar until that power surge last season. After a slow start he’s starting to put things together. Overall he’s at .269, 7 HR, and 38 RBI and batting in the cleanup spot nightly. In the field he has done just fine and maybe even a little better than that. There’s still lots of talk on Philly sports radio about bringing him up, but he will be a Pig for the foreseeable future. You’ll probably see him in LF and at 1B during the upcoming series. He plays 1B about three times a week. Catching has been a revolving door and arguably the Pigs’ biggest weakness. #3 prospect Tommy Joseph (acquired in last July’s Hunter Pence deal) started the season behind the plate, but landed on the DL with a concussion on May 9th. It turned out that it wasn’t his first. He was just about back, but after five games with Clearwater (High-A) he went back on the DL last Wednesday. That’s one of those situations where you start to really worry about the guy’s future. He’s only 21. With Joseph out the Pigs have had Humberto Quintero, John Suomi, Steven Lerud, and Cameron Rupp (another prospect just promoted from Double-A) at catcher. Lerud and Rupp are on the roster right now. 1B Cody Overbeck is quietly having another good season for the Pigs. With a team-high 13 HR, he has moved into 2nd place on the IronPigs career HR list (jumped ahead of Phillies OF John Mayberry, Jr. – behind former Pigs 1B and current Phils Minor League Hitting Coordinator Andy Tracy). 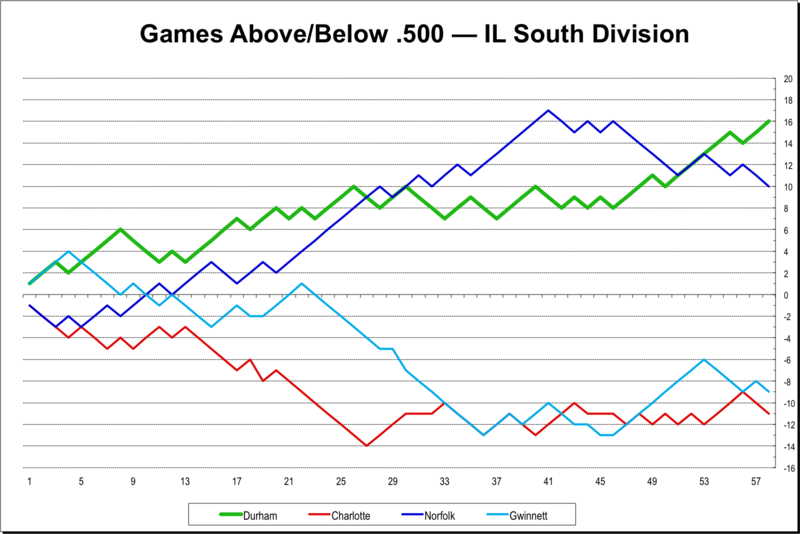 OF Steve Susdorf and DH Josh Fields are having great seasons with .326 and .321 averages respectively (top two avg. on team). OF Leandro Castro will likely miss the Durham series after injuring his hand on the recent road trip. He was a valuable piece in the lineup and for what it’s worth, is leading my blog’s Pig of the Year competition. OF Jermaine Mitchell has been a good leadoff hitter. Pitching-wise the most recent game notes say you will face Raul Valdes, Tom Cochran, Tyler Cloyd, and then possibly Carlos Zambrano (yes, the Carlos Zambrano). Valdes (2-2, 3.41) started the year in the Phils bullpen and was optioned mid-May. He’s had only two bad starts out of 7 total. He’s done well enough, but he should be in the bullpen. Cochran (3-2, 4.68) came up from Reading (AA) in early May and has won 3 of his first 4 starts in June. He’s been better after a bad start. Cloyd (1-6, 7.69) is nowhere near the IL Pitcher of the Year that he was last season. He has been hammered in his two starts since being optioned by the Phillies (where, oddly enough, he didn’t do too badly) to the tune of 13 runs over 9.2 IP. In those two starts he has given up five home runs. Zambrano (1-0, 3.18) may or may not pitch Friday. He has an opt-out clause on July 1st if the Phillies do not call him up. He has started 3 games for the Pigs and posted a 7 inning shutout at Toledo last Tuesday. He’s looked decent enough, but with Pettibone (only 22) holding his own in the Phils rotation, Z’s future is up in the air. If it were me I would not option Pettibone in favor of Zambrano. The Phils are rebuilding and Pettibone will play a role in the future team. Zambrano won’t. Bullpen. We just lost J.C. Ramirez and Phillippe Aumont to the Phillies due to injuries. We’ve yet to get a replacement for either as of Monday morning. We have a closer by committee for the time being since Jake Diekman was called up. Lefty Mauricio Robles is the most likely candidate and hits the mid-90s with his fastball. RHP Justin Friend has been very, very good lately in middle relief. Greg Smith and Zach Miner are long men. As for the rest of the season, I believe the IronPigs have enough talent to make the playoffs. That being said, I have to put out the disclaimer that this is Triple-A and the Phillies might be moving a number of pieces in the coming month. The Pigs could lose that talent and miss the playoffs. But I’m holding out hope…for the entire organization. "The loneliness of the long-distance plowman." Kirby Yates came into the game late with every chance of becoming the hero or the goat — and it was a near-run thing which it would be. 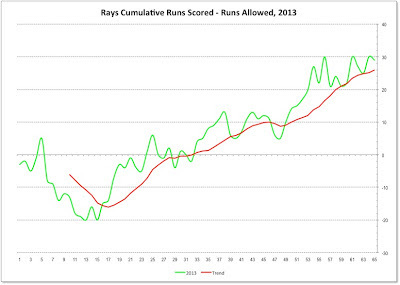 The Bulls had every right to feel fairly comfortable at the top of the 8th. They were ahead 3-0 and Jeff Beliveau, who’d been having a decent year, came in after new guy Merrill Kelly’s solid seven innings. But after five batters a run was in, the bases were loaded, and there was only one out. Get out the hook. Bring in the closer. Yate got a ground out that scored a run and another ground out to end the 8th. The Bulls were quiet for their 8th and Yates was quickly back on the mound on to start the 9th. He walked the first batter, setting up his second big opportunity to be the goat. The famously fast Bat Billy Hamilton came in to run for the Bats' Felhauer. Hamilton stole second base but Yates K’d the batter. One out. Hamilton stole third base, but Yates K’d the next batter. Two outs. Now Hamilton is dancing, but a weak pop to center fielder Bourgeois and Yates is the hero. Yeah, Yates! Merrill Kelly got his first AAA win, but I have to say that overall this was not a good night for baseball … other than the dogs, of course. The Bats’ Daniel Corcino had a no-hitter going into the 4th, but also had put 6 runners on base through BBs and a hit batsman. Like so many games this home stand, the game was sloooow. Kelly was deliberate and if not flashy, he nevertheless was getting batters out. Only two offensive plays stood out, Jesus Flores' very timely RBI single in the 4th and Vince Belnome’s game-winning homer in the 5th. What a find Belnome has been. This home stand has allowed us to do a head-to-head statistical matchup of the performance of two catchers as pitchers. With the Louisville Bats we have Corky Miller. Miller has seen action in 3 games in 2013 (6 in his career). His 2013 ERA is 7.71 over 4 ⅔ innings. The Durham Bulls’ Craig Albernaz has appeared in 2 games in 2013 (13 in his career). His 2013 ERA is a stunning 0.00 over 2 innings. Millers specialty is a knuckleball. Albernaz was reportedly working on a cut fastball over the winter, but we weren’t able to getting any feedback on whether he had used it this year. Albernaz clearly has the bragging rights for AAA catchers as pitchers for 2013. 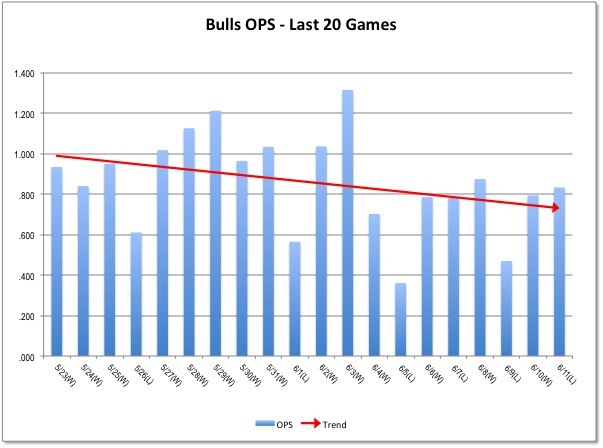 There are some trivial differences in career stats, but since this is a Bulls blog, we won’t go into that. Infielder Ryan Roberts is reported to be in town and ready to play. Jake Odorizzi is back from a decent outing with the Rays up in Boston and likely to go back into the rotation. I wasn’t going to post today, but a couple things have come up. A couple of places are speculating the Wil Myers will get called up sooner rather than later (here, for example), but the Tampa Bay Times isn’t so sure. Then there’s video of the homers here. A comment by Patrick Kinas that Rich Thompson was “out for the year” jumped out at me last night. I was only occasionally listening, but Thompson himself has confirmed to WDBB (via twitter) that he may be out for the year. That’s terrible news for Thompson and the Bulls. New catcher Jesus Flores left the game after just a couple of innings. No reason given for his departure. 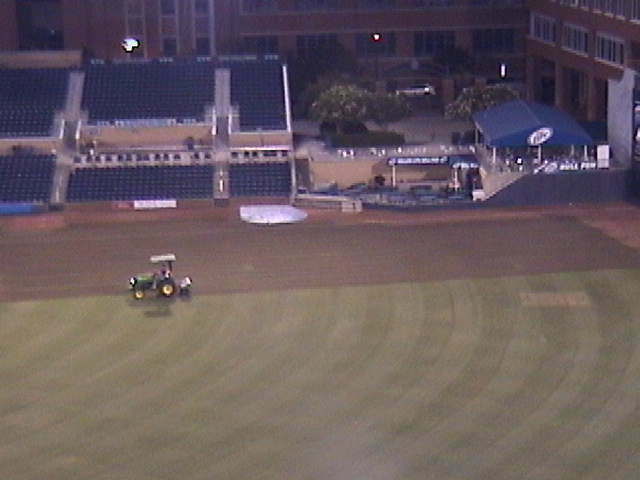 Interesting photo over at Bull City Summer. Bill James offers ideas on how to reform minor league baseball. For a couple of waiting-for-the-game-to-start grins check out 10 Ways to Change MLB. Actually, a couple of them might actually work. Really like the "yellow card" idea. You know, I don’t even want to write about how you go into the bottom of the 8th leading 4-0 with a no-hitter in hand and end up losing the game. Take a look at any of the links for the awful details. The Bulls have been playing with 12 pitchers on the roster, instead of their usual 13, for a couple of weeks. Has that finally caught up with them? Speaking of rosters, Rich Thompson went on the DL yesterday. That makes for 5 players on the Bulls roster on the DL. Nice bus ride down I-65 to Louisville. 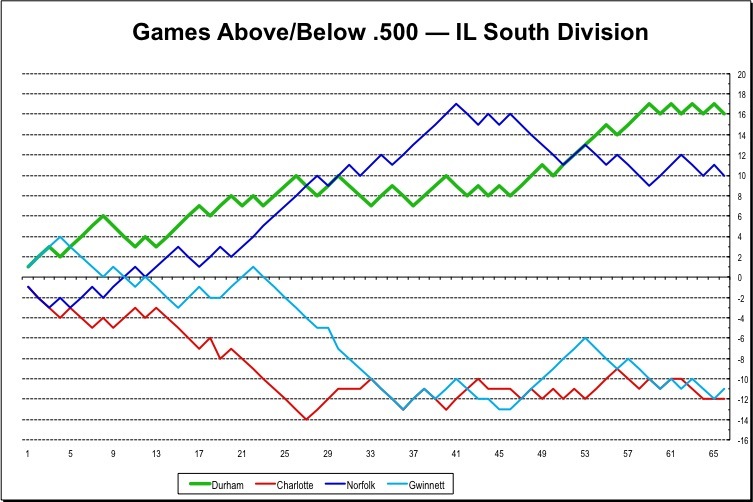 The Bulls will have a rematch with the Indians soon, June 13-16, for another round of the best teams in the IL. 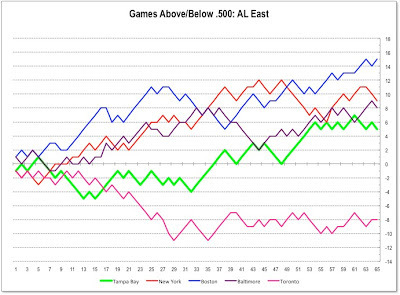 Let’s focus on the Bats for the next few days. 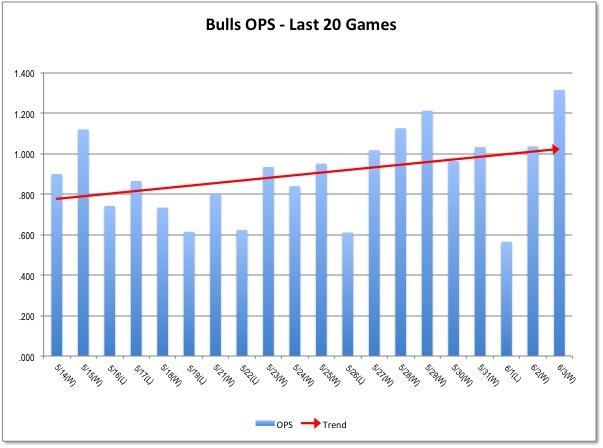 Bats and Bulls have played some great games over the years. The Bats just lost 3 of 4 at home to the Norfolk Tides. The Bulls look pretty strong in the matchup. We’ll see. 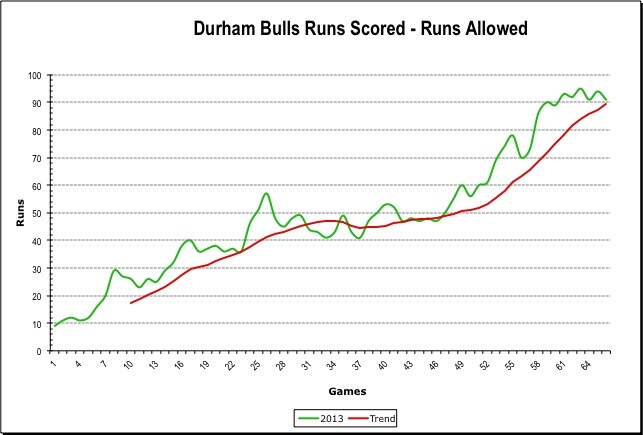 The 2013 Durham Bulls are not a home run hitting team. In fact, they are the bottom team in the International League, hitting only 35 this year. The league leader, the Buffalo Bisons, has hit 66. All the more surprise that they hit four in one game yesterday. Better yet, two of the four were the first of the year for Cole Figueroa and Juan Apodaca. That leaves only Chris Gimenez, Craig Albernaz, and Rich Thompson among this year’s players who have not hit a homer. Shelley Duncan’s and Wil Myers’ were particularly hard hit shots over the Monster. Duncan hit the bull. I think that’s the first time the bull’s been hit this year. Mike Montgomery had a decent outing, his third since coming off the DL. 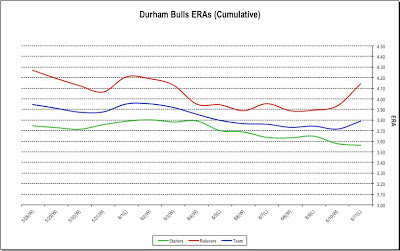 The Bulls are far from having anything like a stable rotation, but with Montgomery there is some hope. Nice glove work by Tim Beckham in the 4th and 5th innings, especially the double play he started in the 5th. Another hopeful sign. Jim Paduch retired rather than take his assignment to Montgomery. 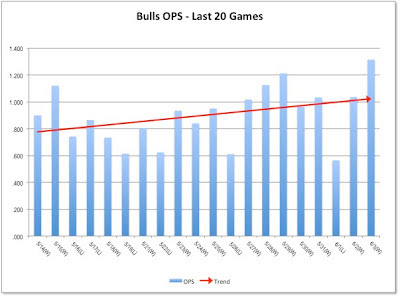 Paduch has been sort of a utility long man for the Bulls for what seems like a long time, but has really just been most of 2012 and all of 2013. His numbers have never been all that good, but he ate up a lot of innings (106 in 2012, 37 so far this year). This year he had only one decent outing. He’s had 10 years of professional baseball, but it didn’t look like things were ever going to get much better for the 30-year old. Good luck, Jim. Norfolk lost. Bull are up two games in the South. Crash has edged out Annie in competition so far this year. Nuke has yet to find his way to the finish line. Cute routine for the Kiss Cam for the three of them. Jim Paduch had by far his best game of the year last night. In fact, if it weren’t for those two pesky home runs by Rail Rider Thomas Neal, Paduch would have had a no-hitter through five innings and 3-hitter through six. The 7th didn’t go so well, with the RRs getting yet another homer and putting three more guys on base before he left the game for new guy Matt Buschmann. So the numbers aren’t great, but after all the criticism we have made of Mr. Paduch, we are happy to say that last night he looked just great. Well-done! Please, please respect the streak. All the streaks. The team is looking simply superb. Three triples last night, by Jason Bourgeois, Tim Beckham, and Cole Figueroa. Three stolen bases, by Rich Thompson, Jason Bourgeois, and Brandon Guyer. A boomer by Brandon Guyer. And then Tim Beckham channeled Fernando Perez at home plate just to top things off. See the nifty video below. If you don’t get to a game in this home stand, do what you can to get your hands on a program. It has a terrific feature on Charlie Montoyo and his 500 wins. A couple of great quotes and a trivia-lover’s delight. I failed to bring a spare battery, so I was without a radio at last night’s game. And then the scoreboard went out. There I was with just my scorebook to follow the game. You get used to those aids: being able to check the pitch count, in game stats, etc. Even glanced up one time and noticed a side-arming RR pitcher. When did he come in the game? (Beginning of the inning as my wife informed me). 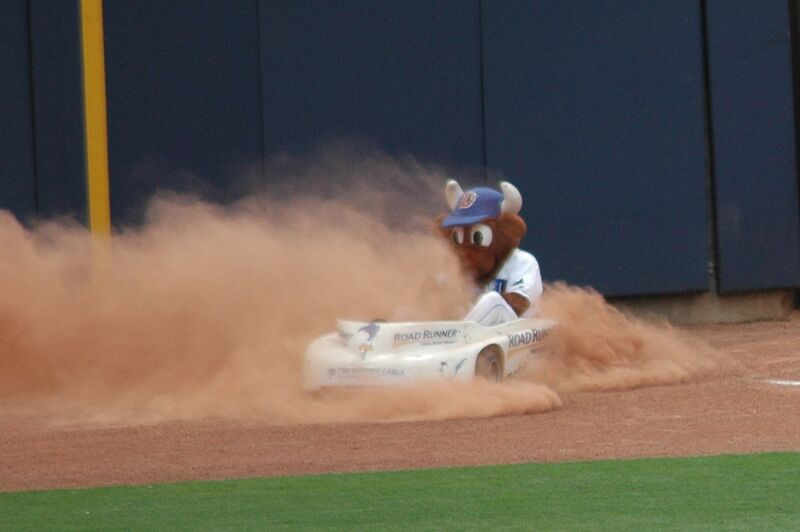 To be perfectly honest I can’t quite get my head around what they are up to over at Bull City Summer. That’s probably my problem. I sometimes can't figure out what I'm up to here. Essay on Tommy John surgery, with video, a bit creepy, and yet fascinating. Video trailer pretty nifty. There's an oddly self-referential feel to all of it: Watch me watching baseball watching me watching baseball. Is baseball art? Is it only art if artists are watching it? 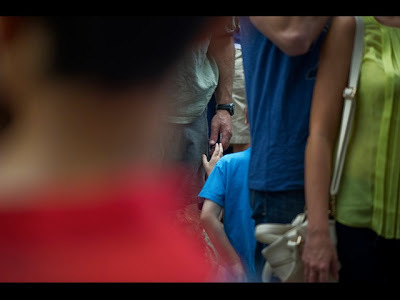 Is the art in the watching the watchers? Worth keeping an eye on or setting your RSS feed to keep up with it. That's what I'm doing.